Copyright. All materials on this website are owned or licensed by Tamarack Stables and are protected under the copyright laws of the United States and under applicable international treaties and conventions. Copyright 2011 Tamarack Stables. All rights reserved. Any reproduction, retransmission, or republication of all or part of any materials on this site is expressly prohibited, except as specifically authorized by Tamarack Stables. Requests for permission to reprint any materials in part or whole must be submitted to Tamarack Stables. Such requests must include a copy of the materials that will be used, and a detailed explanation of where and for what purpose the materials will be used. Contact information, including name, phone number, fax number, and email must also be provided in such requests. Tamarack Stables reserves the right to not allow permission for use of materials on the website if such use is deemed to be inconsistent with the mission and goals of Tamarack Stables. Trademarks. The names, trademarks, service marks, and logos of Tamarack Stables appearing on this site are owned by Tamarack Stables (the "marks") and may not be used in any advertising, publicity, or otherwise to indicate Tamarack Stables affiliation, without Tamarack Stables's prior express written permission. Use of the marks in a manner not consistent with such policies may result in discipline including reprimand, suspension, or revocation and the loss of the use of such marks. Use of the marks without authorization also may result in a legal action for trademark infringement. Disclaimer. Tamarack Stables makes no representations or warranties about the accuracy or suitability of any information or materials on this website; all such content is provided on an "as is" basis. 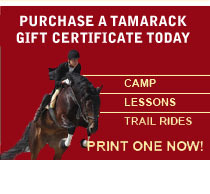 Tamarack Stables HEREBY DISCLAIMS ALL WARRANTIES REGARDING THE CONTENTS OF THIS SITE, INCLUDING WITHOUT LIMITATION ALL WARRANTIES OF TITLE, NON-INFRINGEMENT, MERCHANTABILITY, AND FITNESS FOR A PARTICULAR PURPOSE. Tamarack Stables does not guarantee, warrant, or endorse the products or services of any firm, organization, or person. Links. Although Tamarack Stables may include links providing direct access to other Internet sites, Tamarack Stables has not participated in the development of those other sites, and does not exert any editorial or other control over those other sites. Tamarack Stables, therefore, takes no responsibility for the content or information contained on, or reliability, security, or privacy policies of, those other sites. No Legal or Professional Advice. The information contained in this website has been prepared or compiled by Tamarack Stables as a service to its members and is not intended to constitute legal advice or the rendering of legal or consulting services of any kind. Users of this website should not in any manner rely upon or construe the information or resource materials on this website as legal or other professional advice and should not act or fail to act based upon the information in this website without seeking the services of a competent legal or other professional.